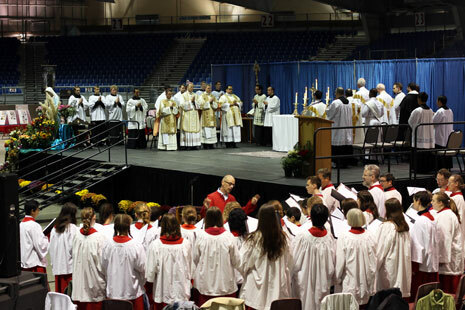 Cantores in Ecclesia performs during Mass at the Rosary Bowl, held at the Oregon State Fairgrounds. St. Mary of Oregon Sister Michael Francine Duncan at a booth at the Rosary Bowl. Many Religious were in attendance, hosting booths honoring the Year of Consecrated Life. SALEM – At the Mass for the ninth annual Rosary Bowl NW, Archbishop Alexander Sample urged the crowd not to be discouraged by the difficult times we are facing. “We must remain people of hope, people of joy, people confident in the victory that our Lord Jesus Christ has already accomplished. We must see the moment as a Catholic moment for us”, Sample said on the first Saturday of October to hundreds of families who gathered to pray for World Peace. The event, dedicated to The Year of Consecrated Life, gathered faithful families from all over the Archdiocese of Portland, “people of deep faith, people profoundly committed to their Catholic faith and devoted to the Virgin Mother”, he said. “It is your love for her, it is your love for her son that brings you out this morning and brought this day for this celebration in the month of October, the month of the Holy Rosary,” added Archbishop Sample in his homily. Cantores in Ecclesia, conducted by Blake Applegate, sang the Solemn Pontifical Mass. Priests and seminarians from Mount Angel assisted in the Mass celebration. A large area in the pavilion was devoted to the Eucharistic Miracles of the World exhibit, which displayed photographs and information and attracted many attendees. Seniors, children and young people stopped at the exhibit to read about about what the church throughout history has recognized as miracles, mostly in the transubstantiation. In addition, monks from Mount Angel Abbey Seminary, sisters from Sisters of Providence and Saint Mary of Oregon were among religious communities that took part of the Vocations Fair. 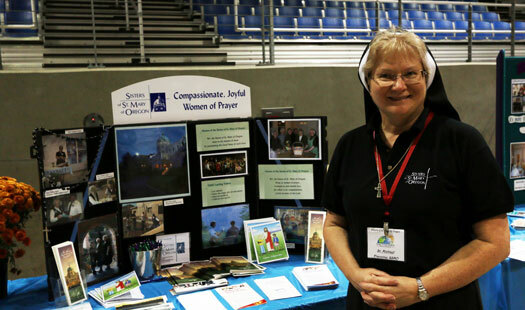 “The religious congregations were invited to come here to exhibit their material because is the year of Consecrated Life; we have many communities here and it’s been a fabulous day with Mass with the Archbishop and praying the joyful mysteries of the rosary” said St. Mary of Oregon Sister Michael Francine. Since 1942, Servant of God Father Patrick Peyton, a Holy Cross priest, began to encourage family prayer, particularly the rosary. He helped make it one of the most widespread form of prayer today among Catholics nationwide. Rosary Bowl NW began in October 2007 in Portland and continues to reinforce community faith. I was there, what a most Reverent and Holy Mass by Archbishop Sample, Priests and Cantores Ecclesia performing Gregorian Chants!! Thank you Archbishop Sample for performing that Extraordinary form Mass, when so many in attendance have not ever seen such a Beautiful Mass! This comment has been hidden due to low approval.